Located in the heart of Tokyo, the State Guest House, Akasaka Palace, was constructed in 1909 as the Palace of the Crown Prince. 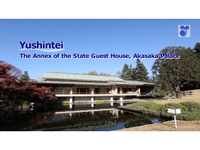 Since 1974, it has served as a venue to welcome many overseas state guests. To offer the general public an opportunity to visit this invaluable building and its gardens, a public opening service was started in April 2016. This program provides information about the public opening procedures.